Utagawa Kuniyoshi (1797-1861) The Sixty-nine Stations of the Kisokaido Road #18: Sakamoto, 1852. Oban. 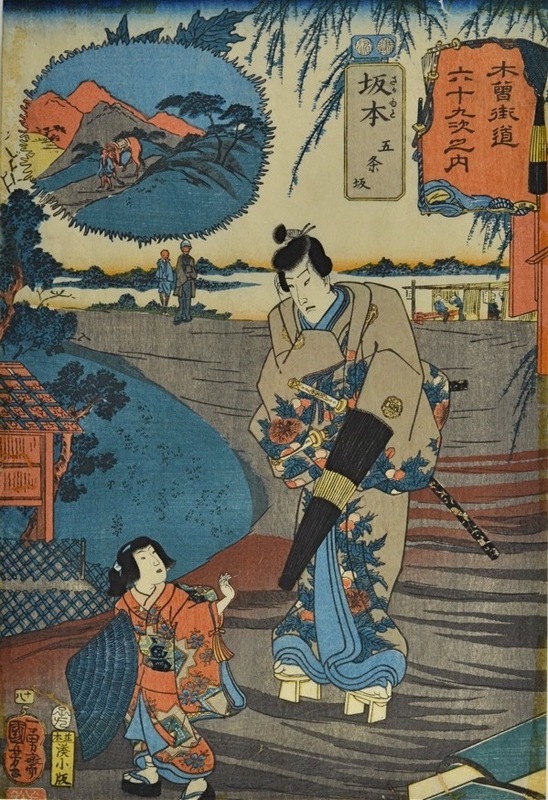 A very lovely print from one of Kuniyoshi’s outstanding series, The Sixty-nine Stations of the Kisokaido Road. There was a frenzy of travel-based print series around the mid-century, initially as artists tried to avoid the censorship that hampered their work, but later series enjoyed playing with the idea of dividing series up in this narrative format. In this great series, Kuniyoshi takes the 69 rest stations along the inland highway that connects Kyoto with Edo (Tokyo). The coastal route was the Tokaido Road. Instead of using actors as subjects, Kuniyoshi here used historic or legendary figures that may have had a connection with the relevant village or station. This print shows the uncompromising warrior Kagekiyo of the Taira clan. Usually shown in battle, here Kuniyoshi chooses to represent him calling at the house of his lover, the prostitute Akoya, from the kabuki play Eight Views of Love in the Floral Calendar. We see Kagekiyo being led to the house of his lover in Kyoto by her attendant (kamuro) and trainee who is still a child. Kagekiyo’s kimono carries the butterfly crest of the Taira clan and is decorated with flowering thistle, the shape making the inset cartouche in the top left of the print. The landscape in the cartouche is a hill above Kyoto. The other series title cartouche on the right, is surrounded with small drawings of Kagekiyo’s personal effects; sword, sandals, an umbrella etc. This series is really one of Kuniyoshi’s outstanding later achievements. These prints of the mid-century have the flamboyant technical qualities that were rarely bettered… the colour is rich and soft, the block carving is confident and exceptional and the overall quality of the drawing and the production are really outstanding. The colour and impression are all fine, the condition is very good, the print trimmed to the image and a small worm hole to the top edge.